I didn't want to go with the easy Y is for Yellow option, or repeat 'Year of the Chinese Animal'. 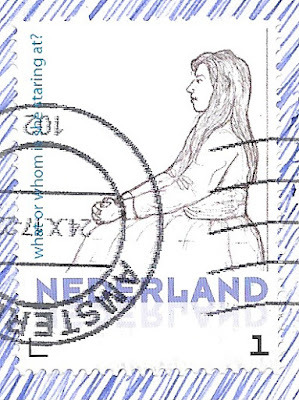 So I present to you a stamp where Heleen has used her own design. It seems like more and more post offices allow you to customize your own design. Here in the US this is licensed to a couple of companies (and you are charged extra for it). I doubt any of these designs are truly collectible, but you never know. 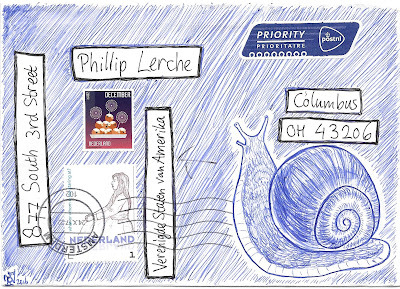 Heleen's envelope came with an added snail, as well as a fun December stamp. 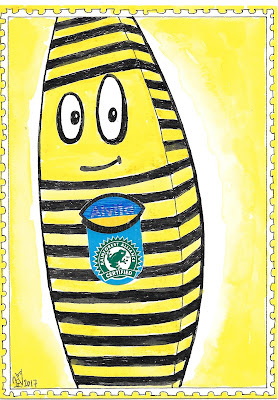 Inside was a stripy banana - thanks for the fun mail, Heleen. 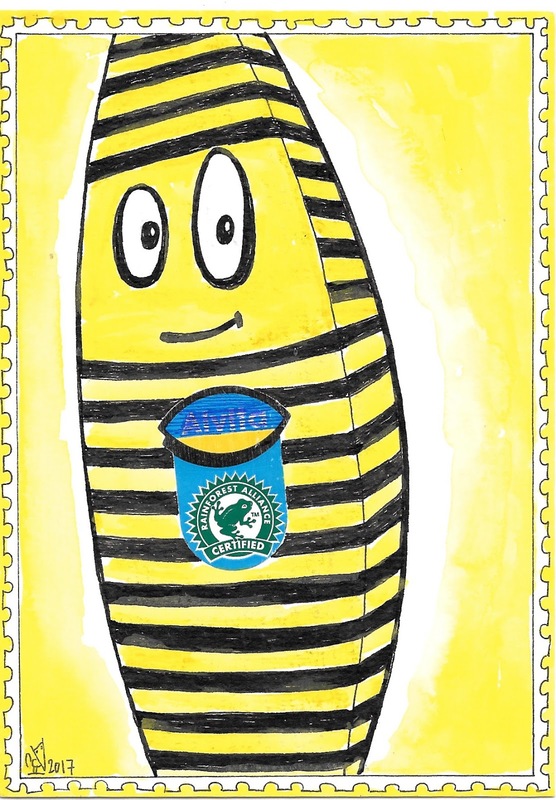 To see more postage with a Y theme, explore the links at Sunday Stamps. Thank you for posting, Phillip! And happy to see that both PostNL and USPS managed to find and send to the correct address! The December stamp shows fireworks and 'oliebollen' (literally: oil bolls), a typical food eaten at 'oudejaarsavond': the end of the old Year and start of the new Year. In Spain you can also made personalized stamps too, but it's expensive: 1€ every stamp, to send a letter whitin Spain, that usually costs 0,55€, for instance. They cost extra here, too, but maybe not quite as much of a price hike as you have in Spain. I like the certified banana, cool envelope. Both are a lot of fun, aren't they. I like doughnuts, so I am sure I'd like these, too. That's such a cute and unusual design! Love it! Heleen is a very good at drawing. I would struggle to draw such a good snail. You are right - certainly with practice I could improve a lot - however it takes the one thing I don't have enough of - time! 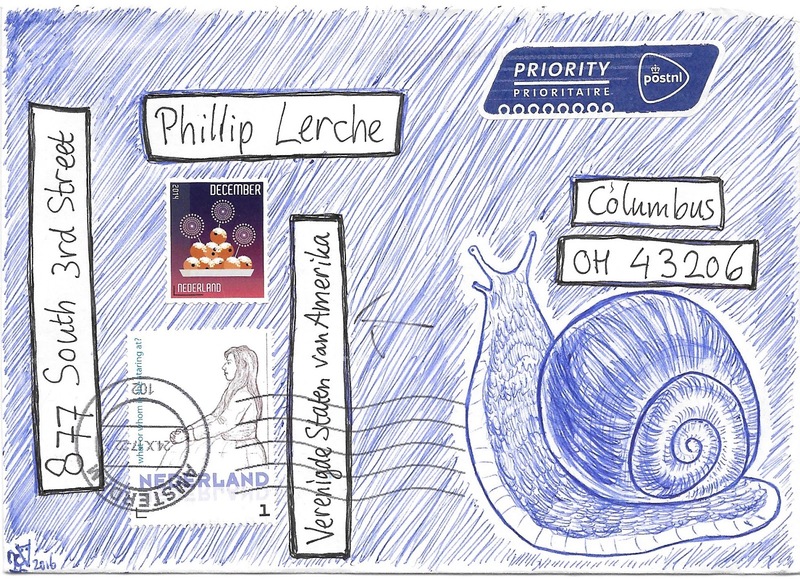 A very well designed envelope Heleen/Phillip and a fun banana.